Discover Our 2019 Summer Camp Opportunities in Jones Bridge! At Discovery Point Jones Bridge, we’re thrilled to offer an exciting summer camp opportunity for children in the Jones Bridge and Alpharetta areas. Summer is a time of learning and discovery, a break from the day-to-day routine. We take this time to inspire children to explore the world around them as they embark on adventures and develop important skills that they can use both in life and in school. Our summer camp program for 2019 focuses on encouraging campers to see the superhero within themselves by challenging their minds and their bodies while providing them with plenty of opportunities to be creative, have fun, and make lasting memories. We’ve created this season’s program around ten weekly themes inspired by some of our favorite selections from children’s literature. These themes offer context for our weekly “mighty missions,” opportunities for discovery and adventure that give campers a real-world understanding of the lessons they’re learning through these stories. We’ve built in plenty of hands-on activities, challenges, competitions, and field-trips to keep children engaged and excited about what comes next. Cooking projects that allow children to be inspired by their taste buds and their imagination. Physical challenges that put health and fitness in the spotlight while encouraging a better understanding of how the human body works. Field-trips that offer adventures to new and exciting locations. Uplifting talks from teachers and guest speakers to give children additional context for literature-based lessons. Puzzles that put brainpower and teamwork at the forefront. Experiments that illuminate the sciencebehind wonders of the natural world. Arts and crafts that inspire campers to be creators, bringing visions from their imaginations to life. 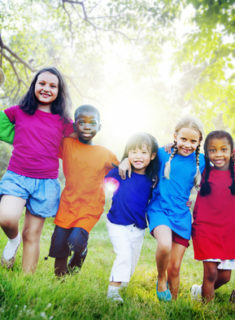 While children are taking part in these fun and engaging activities, they’ll learn valuable lessons about the importance of kindness, respect, friendship, sportsmanship, self-esteem, and more. As they make friends and create cherished memories, campers will also gain an understanding of how to become the best versions of themselves. Our goal is for them to return to school feeling like true superheroes, confident in their own talents and unique superpowers. For more information about our summer camp opportunities in Jones Bridge and Alpharetta, call Discovery Point Jones Bridge at (770) 663-0120 today or visit our child care center.